As well as political cartoonists reworking Old Masters for political comment sometimes iconic images from other media are used. Today (30th Sept 2014) two cartoonists use imagery from the cinema to illustrate the same political conference speech from the Chancellor of the Exchequer at Tory Conference. 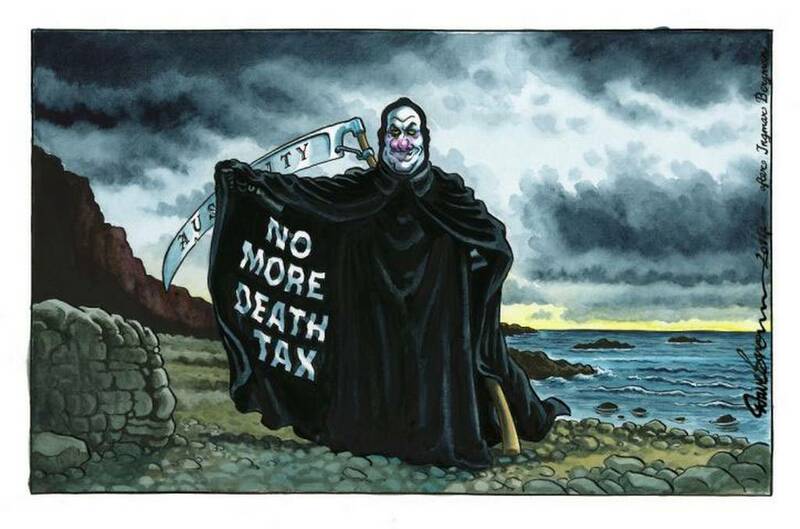 The Independent’s Dave Brown uses Ingmar Bergman’s The Seventh Seal whilst Steve Bell, at the Guardian, makes reference to Danny Boyle’s/Irvine Welsh’s Trainspotting. 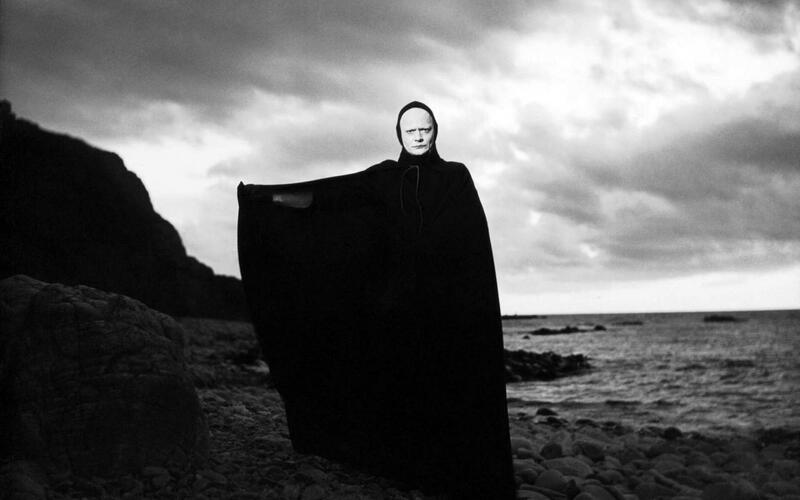 George Osborne, as the Grim Reaper, decides to slash tax on wealthy pensioners (another backdoor reduction in inheritance tax) whilst freezing ‘working-age’ welfare payments to the poorest, withdrawing it all together from 18-21 year-olds and promises further reductions in public sector pay. The irony being that the Reapers scythe is now aimed at the poor and the young rather than the rich and the old (positive Tory voter demographic) blatant and cynical sociopolitical engineering of the worst kind. More austerity for the poor, less austerity for the rich. 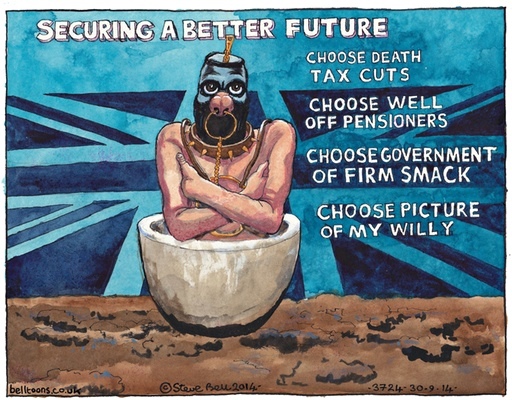 Steve Bell’s contribution is less visually obvious but after hearing Osborne spouting ‘Choose jobs, choose enterprise, choose security, choose prosperity, choose investment, choose fairness, choose freedom, choose David Cameron, choose the Conservatives, choose the future.’ the Trainspotting theme is obvious. ‘…choose David Cameron, choose the Conservatives, choose the future, but why would I want to do a thing like that?’ Priceless. 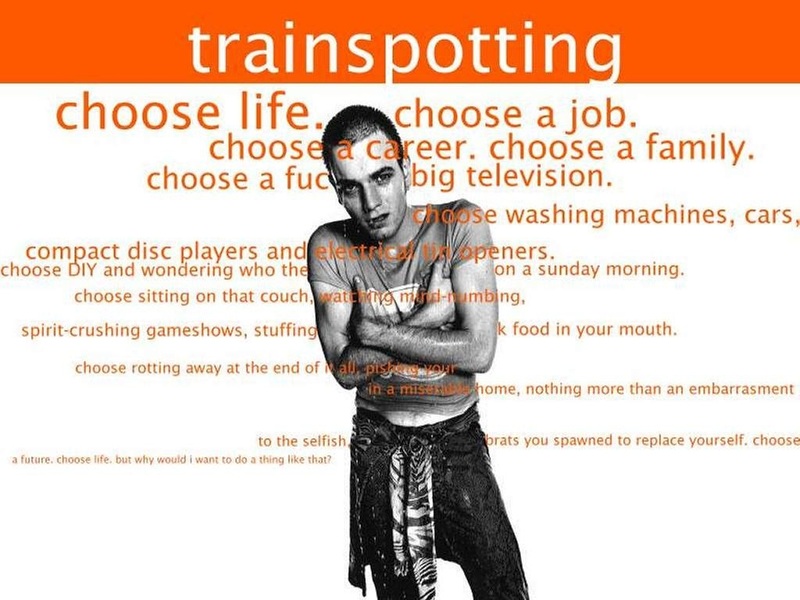 Ewan McGregor, Ewen Bremner, Jonny Lee Miller. UK, Colour, 1996. This entry was posted in Referential Cartoons and tagged Dave Brown, Dave Brown George Osborne, Irvine Welsh, Steve Bell on September 30, 2014 by Chris Walker.